Ovidiu Rata is the founder of the RELIANS group firms – RELIANS CORP, RELIANS Development and Planning, Konsent – companies that provide specialised services in consulting and technical assistance. 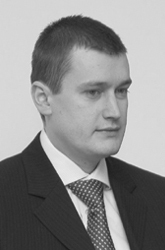 Moreover, he is the Managing Director of RELIANS CORP.
Ovidiu has graduated from “Alexandru Ioan Cuza” University of Iasi, The Faculty of Economics and Business Administration, Banking and stock market specialization. He continued his studies by means of long-term postgraduate programs in the management field, as well as specializing in relevant fields pertaining to project investments, choosing management consultant as his profession. In his 12 years of activity he has offered solutions and business development opportunities for over 500 organizations, both public and private. Ovidiu is confident that the trust of the partners can only be gained by providing professional services and by the reputation a company builds over time, always surpassing the quality standards imposed both by the customers and the organization itself.